Answer: NEVER! Please don’t do that again. The image above shows what I think you’re talking about. 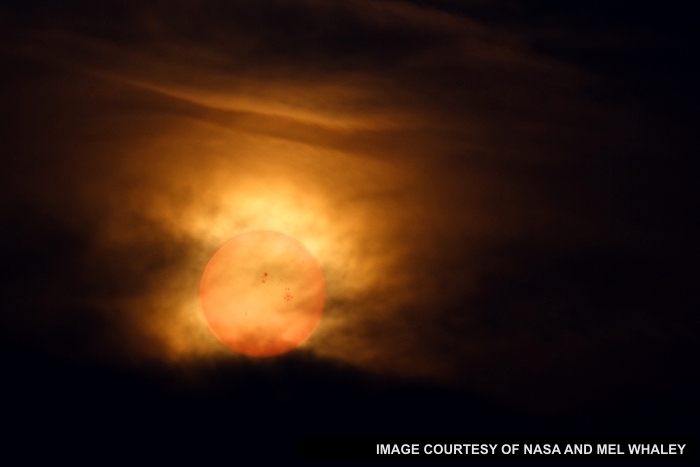 It’s actually a composite of two images as credited, and simulates the Sun at a low elevation as seen through clouds. Under these conditions, people find it “comfortable” to look at the Sun, unlike when it’s overhead on a clear day. It’s even possible to see the larger sunspots, as shown in this simulation, using just your eyes. Looking at the Sun under these conditions might not be “painful,” but it will nonetheless damage your vision. The culprit is ultraviolet light (UV), which will give your retinas the equivalent of sunburn. Your skin can be sunburned, but will naturally repair itself over time. Not so with retinas. Damage there is cumulative and permanent, much like damage to your hearing from repeated exposure to high decibel levels. I wrote about how to observe the Sun safely in my June 11 post about the transit of Venus. Observing the Sun using any other method is not good for your eyes. If you do want to observe the Sun, it can be done safely with the proper equipment. Proper equipment involves special filters that block all the UV and reduce the overall brightness by 99.99% or more. Dedicated solar telescopes like Coronado’s PST are another, albeit more expensive, option. After Galileo invented his telescope, one of the things he observed was the Sun. He didn’t have the filters required to do that safely, and only observed the Sun under conditions similar to those described in CH’s question. Further, the glass available for the lenses in his telescope was much less transparent than modern glass. He lost his sight at age 72, but the experts say that was due to a combination of cataracts and glaucoma. Still, I have to wonder if his observations of the Sun didn’t contribute at least in part. If you point a modern telescope at the Sun, bad things happen. So much heat is concentrated at the eyepiece that its lens will crack from thermal expansion. If you remove the eyepiece and hold a marshmallow where your eye would be, you’ll be able to toast it. Clearly, this is not where you want to put your eye. Observing the Sun is fascinating, and can be done safely. The Sun goes through an 11-year cycle of activity, and is currently ramping up to a peak in 2013 with sunspots, solar prominences, and coronal mass ejections all occurring with greater frequency. This is a great time to start observing our nearest star, the Sun.